A secluded cottage in an idyllic setting, set at the end of a small track with no passing traffic in beautiful Dordogne countryside. The cottage was converted from a 300 year old stone farmhouse to provide modern accommodation while retaining all of its rustic charm. It is maintained to a high standard and has all modern comforts and facilities to make your holiday as relaxing as possible. The exposed stone walls and low beamed ceilings give the cottage a real old world feel, and the thick walls keep the cottage cool inside and provide a respite against the summer heat. Outside there is a sunny patio with a retractable sun canopy for shade, and then just a few steps to the 10m x 5m swimming pool. With a pool depth up to 2m, it's great for diving, exercising, playing or just relaxing. There are extensive gardens of grassy slopes and ancient woodland that you can explore along secret garden paths. Trees on the patio and near the pool provide shade for those hot summer afternoons. The cottage is totally private, and birds and wildlife abound in the natural woodland. We know that you want to keep in touch, even when you're relaxing by the pool, so we have provided wifi access not just in the house but in the garden too. In 2014 we installed a modern en suite bathroom for the master bedroom and we completely refitted the bathroom. Showers are roomy and you get a wide powerful spray, so, no dodging around to catch the drops from an inadequate shower head! Downstairs there is a full size washing machine in the WC. There are attractive paving and railings around the pool and a second patio area with barbecue make the pool and surroundings a real feature of the property. There are sun umbrellas and sun beds for relaxing by the pool and there is lighting in and around the pool so you can enjoy the long summer evenings. To the front of the house, an open sided barn is used to shelter the car and as a wood store. The cottage is on the edge of a small hamlet, and although there are neighbours on one side, they do not overlook the garden, which is on the opposite side of the house from neighbouring properties. Towels and linen are provided, and for rentals of more than a week, clean towels and linen are provided weekly. The property is cleaned between rentals. You can avoid the Ownersdirect service fee by booking direct at francecottage.com. Fraud prevention: We encourage you to phone the owner on 01539 563750 to confirm details. We bought Les Chauses as our holiday home in 2000. After spending many happy holidays there, we moved there permanently in 2006. After 4 years of soaking up the French lifestyle, and now with a new grandson, we decided to move back to the UK to be closer to family. We love our French cottage because it is so peaceful and relaxing and we can enjoy the quiet and natural environment as we please in our private garden and woods. Andrew & Adele Dunn. November 2011. 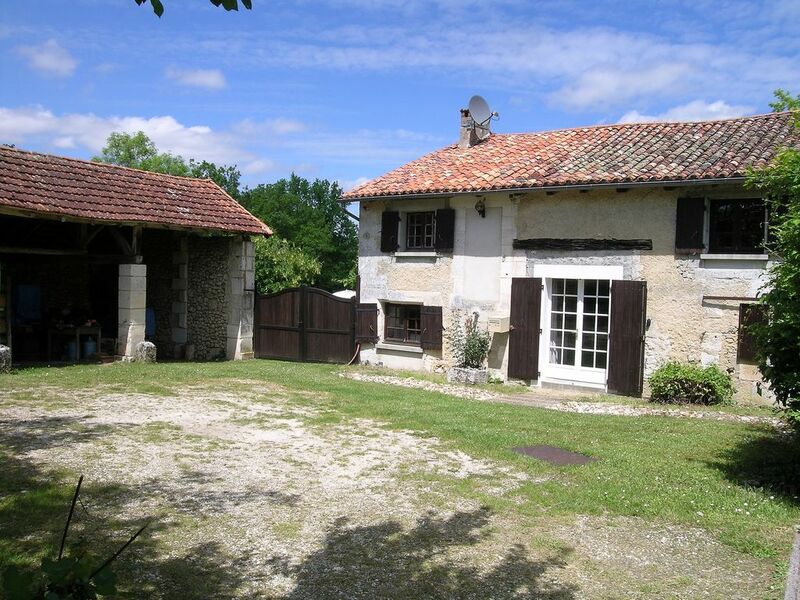 We spent several years of house hunting before we found our perfect French holiday home. We knew when we first set foot in it that we had found our dream property. It had everything we wanted - full of character; large garden and natural woodland; a totally tranquil environment, with only the sounds of wildlife and the countryside; surrounded by beautiful countryside and picturesque towns and villages with superb restaurants. To complete our dream holiday home, we just needed to build our 10mx5m swimming pool, and to update the house with modern amenities. We think Les Chauses is a unique holiday home. Properties that offer such a combination of beautiful surroundings, tranquility and privacy are few and far between. The pool and garden are not overlooked and are solely for the use of guests. The cottage is on the edge of a pretty hamlet, so it is not totally isolated and you will meet the neighbours around the hamlet, but it is at the end of a small track, so there will be no passing traffic to disturb you. The newly refurbished bathroom has washbasin, toilet and a shower-bath with extra space in the shower area. The master bedroom has en suite bathroom with washbasin, toilet and good sized modern rain-head type shower. Large living room, triple aspect, large fireplace with a wood-burning stove. Exposed stone with original alcoves and beamed ceiling. English TV, Freesat TV recorder, DVD/CD player with hi-fi amp & speakers and a range of music. Guests can order a grocery pack to get them started on arrival. Groceries are charged at cost. Ordering details will be provided after booking. Large well equipped kitchen/dining room, with gas oven and 4 ring hob, microwave, dishwasher, fridge/freezer, toaster, iron and ironing board. French doors open on to the patio and the path down to the pool. Bicycles are £10 per week each. Municipal golf course at Perigueux (15 miles). Notes on accommodation: An optional grocery pack is available to get you started with your basic groceries. Please contact the owner for details. This is an ancient property and has low doorways and low beams, which require care, especially for those who are taller than average. Internet access and WiFi is available. For technical reasons, internet is not guaranteed and does not form a contractual part of the agreement. Well behaved pets are welcome. A beautiful and very relaxing stay at les Chauses. We stayed for a week but really we would have loved another week. The weather was scorching, in the 30's in May! The area is so quiet and peaceful, we were amazed by the amount of stars you can see at night. We took our bikes (although you can hire them here) it is a fantastic area to cycle around as the roads are so quiet and there are many restaurants within a close distance. We went to the Moulin du Pont in Lisle (took the long way round) the position on the river is beautiful and they even have their own trout on the menu. The house was very clean and the kitchen has everything you would need. I would certainly recommend the property and hope to be back again next year! Leila, thank you for taking the time to post your review. We're glad that you enjoyed your stay and hope to see you again in the future. Lovely stay at Les Chauses. We had been before, but now the bathrooms have been re-done and there is really (!) good wifi, it makes such a difference. We had some lovely weather which helped! Andy was really informative in the leas up to the holiday and provided all the information we needed to make it stress-less! We had two weeks staying at Les Chauses with our two young children and Grandad and the weather was great. The area is very peaceful and quiet and we loved our time by the pool. We visited both Bourdeilles and Brantome for coffee, dinners and drinkies and sometimes just to wander around and absorb the atmosphere. Lunch at Le Mouline De L'Abbaye, Brantome was a particular high point. Highly recommend the kayaking on La Dronne with a picnic. All in all this holiday was the perfect combination of much needed relaxation, laziness and some great stuff to do and the property is ideal for that. My girlfriend, our three boys and I stayed for a week in August. We had a mixed week of half rain and half scorching sunshine. The house is located up some small lanes into a hamlet and is situated right at the end. One great positive which I did not realise is that the pool is heated. The previous year's holiday, a 20 degree pool can seem a little chilly, even on a hot day but this was 25-26 degrees so lovely in all climates. The house itself has all the things you would need although a little dark if you are inside sheltering from the rain. A few board games would have been nice but as a seasoned Dordorgne/Charente traveller, the weather is usually scorching sunshine! The master bedroom is very nice with loads of space and a great en-suite batthroom. The other two rooms area also good sizes and all have fans which you need if the weather is warm as it can get quite hot inside. Bourdeilles is just a 8-9 minute drive away (come out of the house down to the hamlet square and look for the sign) and there is a great boulangerie and a village shop which sells some great local boxes of wine and actually has a good selection of cheese/milk/meat etc if you don't want to drive all the way to Brantome (20 mins away). Brantome is definitely worth a visit and best way is to head on the road north of the river dronne and get on the dual carriageway to Peregeux before you get to Brantome. Follow this south for a mile or so and head into Brantome from the roundabout. This takes you past the local Carrefour supermarket and further up are lots of free car parks before you walk over the bridge into Brantome. I would just like to clarify, to avoid confusion, that the pool is not heated. However, it gets quite warm in hot weather. Ours was a return visit to this beautiful place. The farmhouse is rustic, spacious and comfortable, well equipped and hidden away at the end of a tiny ancient hamlet. WiFi and the smart new bathroom and en-suite shower room were a bonus. The lovely large garden and woodland are private and peaceful. We enjoyed lingering lunches in the shade of the apple tree and evening barbecues beside the pool. Mostly you hear only the sounds of birds and insects. One bird has learned to imitate the sound of the pool alarm resetting itself. The night sky is amazing because of the lack of light pollution. We were fortunate with the weather, mainly warm and sunny, and swam most days even though the pool is getting cooler at this time of year. Cycling through the lovely countryside is a delight. The roads, lanes and tracks are so quiet. We can recommend cycling to La Tour Blanche for a good-value set lunch. Very good food lunchtimes and evenings at Le Moulin du Pont near Montagrier. Beautiful Brantome is a must to visit as is nearby Bourdeilles;a tiny town with a large chateau. Thank you to the owners and the kind couple who keep the house, garden and pool so well for a wonderful stay. Can't wait until the next time. Swimming and canoeing are available on the Dronne (5 mins). Limoges: 90mins; Bergerac: 90mins; Bordeaux: 2 hours. Caen: 6 hours; Le Havre: 7 hours; Calais: 9 hours. Bourdeilles (local shops & restaurants): 2 miles. Brantome (shops, restaurants & supermarket): 8 miles. Perigueux (hypermarket, supermarkets, shops & restaurants): 18 miles. The house is approximately 300 years old, restored and equipped to a high standard with all modern appliances, en suite master bedroom and newly fitted bathroom. The surrounding countryside is green and attractive, with rolling hills. and many delightful walks from the door. It is also wonderful cycling country and four mountain bikes are available suitable for teenage to adult. There are numerous opportunities for sightseeing and leisure activities, such as canoeing on the river Dronne at Bourdeilles (2 miles). Bourdeilles is a lovely picturesque village with an 11th century chateau, shops and excellent restaurants. Brantome (8 miles) is an interesting market town, and is known as the "Venice of the Dordogne" being surrounded by the river Dronne. It has an 11th century abbey and many other interesting buildings and attractions. Perigueux (18 miles) is the capital city of the Dordogne and has a unique cathedral, roman remains and many other attractions. There are spectacular natural formations to be found in the caves at Villars, and dozens of other activities and places to visit in the surrounding area. Relax in this beautiful setting in the rolling Dordogne countryside. Enjoy the top class food at local restaurants, canoe down the River Dronne, or visit the many interesting attractions and picturesque villages. Nearby activities: Tennis, fishing, canoeing (all within 2 miles). Horse riding (4 miles). Countryside walks and cycling from the door - up to 4 mountain bikes are available at a cost of £10 per week each. All bookings are subject to conditions. Change over day: Saturday. Arrival after 4pm, departure before 10am. Up to 4 mountain bikes are available at £10 per week each. This can be arranged with the owner after the booking is confirmed. Phone: You can contact us on (+44) 1539 563750, where we will be happy to answer any of your questions.